﻿The year 1928 marked major turning points both in physics and in the Department of Physics at Purdue. Work by De Broglie, Heisenberg, Schrodinger and others in establishing the foundations of quantum mechanics during the previous several years culminated in the fall of 1928 with the controversial Copenhagen interpretation presented by Bohr and Heisenberg. As Heisenberg and Born declared quantum mechanics complete and unchangeable to a conference in Belgium, a young Viennese physicist named Karl Lark-Horovitz began his appointment as a professor of physics at Purdue. Until his untimely death exactly thirty years later, Dr. Karl Lark-Horovitz elevated and maintained the Department of Physics in the leading ranks of modern physics research and teaching, rendering his mark upon it down to the present day. 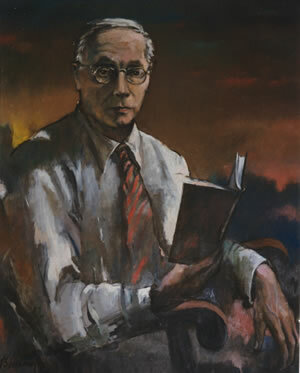 Dr. Karl Lark-Horovitz was born as Karl Horovitz in Vienna, Austria in 1892. He later linked the last name of his wife, Betty Lark, to his own. His father, a noted dermatologist, was knowledgeable in many subjects outside of medicine, including botany and the writings of the Roman poet Horace. Lark-Horovitz attended a "humanistic" Gymnasium (high school) where students were schooled in the classical languages, literature and history. He entered the University of Vienna in 1911, where he studied chemistry, physiology, and physics, with a minor in the pre-Socratic philosophers. Owing to an interruption for military service during World War I, he did not receive his doctorate in physics until 1919. He served for four years in the Austrian Army as a signal corps officer, and was once hospitalized for an extended period while recovering from a wound suffered at the front. It is interesting to note that he started his career in the same general area (electronic communications) in which he finished it (as a pioneer in solid state electronics). Lark-Horovitz's success in transforming the department owed to fortunate confluence of his personal abilities with his times. With the new fields opened by quantum mechanics, a new generation of American physicists, numerous European visitors, and funding from public and private sources, American physics was on an upswing by 1928 and had virtually closed the gap with European physics. Astute administrators, such as Dean Moore, eagerly snatched up visiting Europeans for their graduate research programs. After Dean Coulter's scathing assessment of the "intellectual sterility" of the Purdue science faculty in his farewell address of 1926, his successor, Dean (until 1931) Moore, set out to establish graduate research in every science. In 1929 Purdue President Edward C. Elliott organized all graduate study into the Graduate School, and a year later he founded the Purdue Research Foundation to gather and distribute research funds. Only a man of Lark-Horovitz's vision and strength of character could enter a situation such as this and so rapidly transform the department into what it became. President Elliott, who was considered "abrasive and dictatorial" by his faculty, probably saw a kindred spirit in the new physics professor. (4) Over the objections of his other faculty, the President granted Lark-Horovitz' urgent request to reduce the physics teaching load from 15 hours to 9 or 10 hours. From his very first semester, Lark-Horovitz introduced graduate and undergraduate courses in twentieth-century physics, teaching most of them himself. After becoming department head in 1930, he obtained significant funding from the administration to establish full-scale machine and glass-blowing shops for faculty and students to fabricate their own instruments, and for hiring new first-rate faculty and graduate assistants. He also insisted upon expanding the paltry physics library as a research tool, obtaining runs of all the major research journals (rendering the library to this day a major historical resource). In response to his prodding, the administration, local industries and wealthy benefactors -- notably well endowed alumnus David E. Ross -- contributed funds for equipment and two major additions to the old physics building in 1934 and 1937. The pace of reorganization was remarkable. By 1930 Lark-Horovitz had strengthened teaching and research in contemporary physics with invitations to ten visitors who delivered 38 lectures on nearly every aspect of modern physics, and he added 15 new graduate students and three new faculty members with doctorates. Four of these newcomers were among the six who became permanent members of the department: Isador Walerstein, Irving Geib, Hubert J. Yearian, and Edward Akeley, with Geib and Yearian arriving as graduate teaching assistants. Yearian received Purdue's first doctorate in physics with a dissertation submitted in 1934 on electron diffraction, research that he had started in 1929, just two years after the discovery of this phenomenon. Also in 1930, Lark-Horovitz established a new program in theoretical physics with the addition of Dr. Edward Akeley to the department, and he recommended the eminent European mathematicians Cornelius Lanczos (who had worked with Einstein) and W.E.O. Maier to the mathematics department. The program was later enhanced by permanent members Vivian A. Johnson, who first joined the staff as a teaching assistant in 1932, and Dr. Hubert M. James, who became Assistant Professor in 1936. Among the successes of this early teaching program was Edward Mills Purcell, who graduated from Purdue in 1933 with a B.S. in Electrical Engineering. 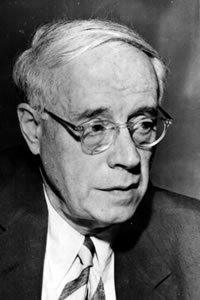 He shared the 1952 Nobel Prize in physics with Felix Bloch for work on nuclear magnetic precision measurements. While an undergraduate at Purdue, Lark-Horovitz enabled Purcell to participate in electron diffraction experiments, which lead to Purcell's first publication as a co-author with Yearian and Lark-Horovitz. Judging from Lark-Horovitz's pleas to the administration during this period, funding was always a problem but apparently never an obstacle. The faculty and students constructed and maintained nearly all of their own equipment in the well-tooled department shops. The department weathered the inevitable cuts and unemployment during the nightmare years of the early Depression without noticeable effect. Although all of the staff took large salary cuts until the end of the decade, the numbers of students and faculty and their rate of publication were nearly constant. Frugality remained a virtue, even after the worst was over. A cyclotron and a Van de Graaff accelerator were built in the late 1930s at the incredibly low costs of $9030.90 and $825.62, respectively (not counting, of course, the considerable student and faculty labor). As the new department head, Lark-Horovitz reorganized departmental research into four major sections: x-ray research; optics; precision acoustics; and physics of surfaces. Among the 19 projects in these sections, listed in his 1930 report to Dean Moore, were the following: the electromotive force of dielectrics; the determination of crystal structure by the Laue method; crystal structure at low temperatures; the viscosity and conductivity of molten glass; the fine structure of x-ray scattering; wave properties of the electron; Raman effect in solids; the determination of surface layers with radioactive indicators; and studies of the Zeeman effect. Even more remarkable is that all but the last of these were listed under the direction of Karl Lark-Horovitz. The department presented a total of 69 papers during the years 1932-34 before national society meetings, academies, and in scientific journals. In 1935 Lark-Horovitz reported to the alumni that a new wing (of 8523 sq. ft.) had been added to the Physics Building. (5) The "heart" of the new wing was a complete new instrument shop. Also included were new laboratories for the department's strongest areas at the time: x-ray research, electron diffraction, atomic disintegration, and atomic and nuclear structure. Much of the old space was now devoted to a new graduate program in applied physics for industry and to new spectroscopic studies of hyperfine structure in connection with problems in nuclear physics. These topics indicate that by 1935 the department was already moving into a new and important area of research: nuclear physics. Nuclear physics at that time was closely allied with the field of elementary particle physics at high energies. In an era before accelerators had reached high energies (above about 100 MeV), the latter meant the study of cosmic-ray interactions with matter. The turn to nuclei and cosmic rays at Purdue and elsewhere came on the heels of another important series of profound developments in physics, this time during the years 1932-34. Among these developments were the discoveries of the deuteron and neutron, the development of the neutron-proton model of the nucleus, the introduction of the Yukawa (strong) and Fermi (weak) forces, the discovery of the positron and its identification with Dirac's anti-electron, the observation of cosmic-ray showers, and the inventions of the cyclotron and the automatic Wilson cloud chamber. The entire physics community buzzed with these developments, and Purdue immediately engaged in these new areas. In his annual report to the administration for 1934-35, Lark-Horovitz noted that the department had already set up a seminar for itself on nuclear physics. Thanks to the proximity of Ann Arbor, lecturers at the famous Michigan summer school in physics were invited annually to Purdue beginning in that year. Hans Bethe, author of the famous "Bethe bible" on nuclear theory, delivered five lectures in the summer of 1935 on "Problems of the Nucleus" and returned almost annually to report on recent progress. A steady stream of "big name" nuclear and particle physicists, along with leading researchers in many other areas, journeyed to West Lafayette to give seminars during the next five years. Among them were Segre, Teller, Wigner, Herzberg, Feenberg, Breit, Rabi, Serber, Placzek, Konopinski, Compton, Herta Sponer, and E.O. Lawrence. R.H. Fowler became a visiting professor in 1938, lecturing extensively on statistical thermodynamics. Werner Heisenberg spent the entire month of July 1939 at Purdue lecturing five times a week on cosmic ray research; and J. Robert Oppenheimer delivered a series of 10 lectures in 1940 on "The Crisis in Modern Field Theory." In addition to the many visitors, the department increased its staff, especially in the areas of nuclear and particle physics. Cosmic-radiation theorist Lothar Nordheim arrived in 1934 as a visiting professor with his wife, Dr. Gertrud Nordheim, also a physicist. J.F. Carlson (a former Oppenheimer student), R.D. Present, and J.K. Knipp, arrived in the following years and were heavily engaged in nuclear research. By 1939 they were already working on a new discovery of enormous importance, nuclear fission. Analysis of tones produced by open violin strings; study of acoustical properties of wood; theoretical and experimental determinations of acoustic impedance (C. K. Sedan). Study of hyperfine structure of lithium using a cooled discharge tube; study of fluorine spectra using a hollow cathode tube. Study of disintegration of high energy cosmic-ray protons in matter, coordinated with Oppenheimer and Serber at Berkeley (Nordheim); study of the nuclear force in proton-proton scattering, in collaboration with Breit and Condon; study of approximations in Fermi's theory of beta-decay (Nordheim); mathematical applications of the general theory of relativity (Akeley); general problems in wave mechanics applied to atomic and nuclear systems (James); charge distribution in crystal lattices (Johnson); distortion of atomic electron shells due to crystalline lattice fields (Johnson and Nordheim); gamma radiation associated with beta emission and internal conversion of positrons emitted from light nuclei (Knipp and James). Analyses of glasseous selenium (E.P. Miller) and wood varieties (W.I. Caldwell); molecular structure of gaseous sulphur and selenium investigated by electron diffraction (J.D. Howe); investigation of atom factors in electron diffraction patterns. Construction of a cyclotron magnet (Yearian and Howe) and study of its flux properties (Howe and Walerstein); construction of power supplies, transmission lines, source tubes and counters for the cyclotron (grad students). A year later, a sixth division was added, the Division of Physics Teaching Research, under Lark-Horovitz and Walerstein. The new division reflected Lark-Horovitz's abiding interest in science education for non-science students and elementary and secondary pupils. He directed several educational reform endeavors in the state, helped found the Indiana chapter of the American Association of Physics Teachers, and devoted considerable time to the development of physics courses at Purdue for home economics, education, and liberal arts students. Consistent with his background in the humanities, he believed strongly in the historical approach to the teaching of physics. The vigorous program in experimental nuclear physics during the late 1930s more than matched the upswing exhibited by the department in nuclear and particle theory. The department performed a series of cosmic-ray balloon experiments, launching photographic apparatus from the new Purdue Airport. As early as 1935 came the decision to construct both the Van de Graaff accelerator and a cyclotron. (9) The Van de Graaff was designed to produce energetic neutrons through high voltage deuteron-deuteron reactions. The neutrons were to be used for the study of neutron diffraction and the neutron activation of heavy elements. The Purdue Research Foundation funded construction of the device by three graduate students, R.E. Schreiber, R.E. Holmquist, and W.A. Miller. R. D. Elliott constructed an automatic Wilson chamber as a detector. They completed the Van de Graaff in early 1937. Unfortunately, it delivered only about a 0.25 milliamp current of 250 KeV deuterons. This was later raised to 500 KeV, but neutron diffraction studies remained impossible until the acquisition of intense neutron beams later available from reactors. On the positive side, however, the Van de Graaff was suitable for department studies beginning in 1939 of fission fragments on photographic plates resulting from the slow-neutron fission of uranium. As with the Van de Graaff, the construction of the cyclotron on a shoestring budget was a near miracle. The only other one in existence in the United States at the time was Lawrence's Berkeley machine. Drs. Yearian and John Howe began construction of the magnet in 1936. The machine was completed in August 1938 by Drs. Henderson, King and Risser. By the end of the year it was producing a 3 microamp beam of 8.3 MeV deuterons ... a current sufficient to begin a viable research program on nuclear reactions. A year later, remote controls and water walls were added to protect the staff from radiation. Their other research included the production of radioisotopes for tracer experiments on biophysical systems and projects carried out in collaboration with other departments at Purdue. All of this raised the stature of the department on campus significantly, enabling it to increase its share of resources in Purdue's zero-sum game during that period. Lark-Horovitz played the game remarkably well. According to an annual report in 1940, the department employed 22 senior faculty and 21 graduate assistants. Of the graduate students, eight were in nuclear physics. Six obtained doctorates in June 1941. In that same year Lark-Horovitz had a hand in the development of another future Nobel laureate, Julian Seymour Schwinger, who shared the 1965 Nobel Prize in physics with Richard Feynman and Shinchiro Tomonaga for research on the theoretical basis of quantum electrodynamics. With recommendations from I.I. Rabi (Schwinger's mentor at Columbia) and J. Robert Oppenheimer (Schwinger's postdoctoral mentor at Berkeley), Lark-Horovitz persuaded President Elliott to offer the 22-year-old Schwinger a faculty position in the department. The department provided the young Schwinger a sheltered environment with ample opportunity for professional growth during the early chaotic years after the United States entered World War II. Schwinger left in 1943 for wartime service at M.I.T. 's Radiation Laboratory. A year after Schwinger's departure another future Nobel laureate became affiliated with the department, Benjamin Roy Mottelson. He received a B.S. in Physics in 1947 and went on to obtain master's and doctoral degrees from Harvard. He shared the 1975 Nobel Prize in Physics with Aage Bohr (the son of Niels Bohr) for development of the collective theory of deformed atomic nuclei. The Department's increased stature on the campus due to its thriving research program was reflected not only in the funding of new faculty and the many first-rate visitors but also in new construction. The new additions of 1934 and 1937 were followed in 1941 by the construction of a completely new building. Lark-Horovitz registered the need for new construction in a 1936 report to the administration projecting departmental budget needs through 1939. (10) The department found itself in a difficult situation, he wrote, due to "the new and sudden influx" of undergraduate students. In order to accommodate them, he noted, the department was forced to reduce research and office space and to convert two rooms into undergraduate facilities at a time when staff and visitors were on the increase. Lark-Horovitz called for a new story to be added to the new addition, but apparently the price tag of $54,000 proved too much and the department had to make due with less ambitious alterations for the next five years. Finally, thanks to the generosity of Mrs. Alice Earl Stuart, the department obtained major funding for the construction of a new physics building as a tribute to Mrs. Stuart's late husband, Charles Benedict Stuart, a former member and president of the Purdue Board of Trustees. The new building, now the older section of today's building on Northwestern Avenue, was completed in 1941 and dedicated in 1942 as the Charles Benedict Stuart Laboratory for Applied Physics. The new program in applied physics for industrial research had apparently served as a strong argument in its favor. Over sixty luminaries from throughout the world of physics journeyed to West Lafayette for the dedication of the new physics building during a two-day conference on problems of modern physics, held on June 19-20, 1942. The program included addresses by Edward U. Condon, Julian Schwinger, Wolfgang Pauli, and Donald W. Kerst, among others. With completion and dedication of the new building for a physics department now recognized to be on the forefront of research in many areas, along with the recent entry of the United States into World War II, this event marked in a very real sense the close of the first phase of the Lark-Horovitz era at Purdue, and it set the stage for the exciting events that were to occur in the Physics Department during World War II and its aftermath. Department of Physics, Annual Reports, 19 28-1940 (Dept. archive). Solomon Gartenhaus and Arnold Tubis, "A Short History of the Physics Department of Purdue University," manuscript; abridged version published in Sequel. V.A. Johnson, Karl Lark-Horovitz: Pioneer in Solid State Physics (New York: Pergamon Press,1969). Daniel J. Kevles, The Physicists: The History of a Scientific Community in Modern America (New York: Knopf, 1978). Karl Lark-Horovitz, "Physics at Purdue and the New Physical Laboratory," The Purdue Alumnus, 22 (April 1935), 6-7, 25. "Karl Lark-Horovitz and Physics at Purdue 1928-1958: A transcription of words spoken on the evening of April 24, 1958 by members of the Physics Department" (Dept. archive). Robert W. Topping, A Century and Beyond: The History of Purdue University (West Lafayette: Purdue University Press, 1988). "Anna Akeley: Just A Simple Physics Teacher' Looks Back on Her Purdue Career," Purdue Physics, 1, no. 1 (June 1989), pp. 11-13. Emilio Segre, A Mind Always in Motion (Los Angeles: University of California Press, 1993), p.160. Lark Horovitz, Annual Report, 20 Feb. 1930. L. Nordheim to Arnold Sommerfeld, 24 Oct. 1936 (Archive for History of Quantum Physics, microfilm 32, sect. 9). H.M. James to E.C. Kemble, 4 Aug. 1937; quoted by Kevles, p. 279. See D.J. Tendam's remarks in "Karl Lark-Horovitz...1958." Department, Biennium Report 1937-1939, in 1936 (Dept. archive).